There is something about this time of year that is so heart warming. The decorations, the music…. the giving and merriness of the season. I’ve even come to (secretly) enjoy the crazy Christmas hustle. One of my favorite traditions of this time of year is receiving Christmas cards in the mail. This is especially true these days, where it seems that everything has gone digital. There is just something so exciting about getting something other than bills or junk in the mail. Its so personal. This year, I decided that I needed to figure out a way to show off all the beautiful cards we received from our friends and family and I have to say, I think it turned out pretty great! After seeing a few inspiration photos online, I picked up this beautiful garland from Michaels and quickly set it up on our staircase using white pipe cleaner. Hanging the cards was super easy, I simply used my favorite ribbon and tape. The staircase is literally the first thing you see when you walk into my home and I love seeing this simple, yet beautiful display when I open the door. « 5 Tips for an Easy DIY Christmas Photo Shoot! Yay, can't wait to get it in the mail! This is so cute for those who have stairs!! I love this idea? Me too, I love walking inside to see this all these beautiful cards hanging up! So pretty I love this idea! I loved doing this when I had stairs. It looked so fun and festive! I'd love to see what you are doing now, without stairs! love love love this! 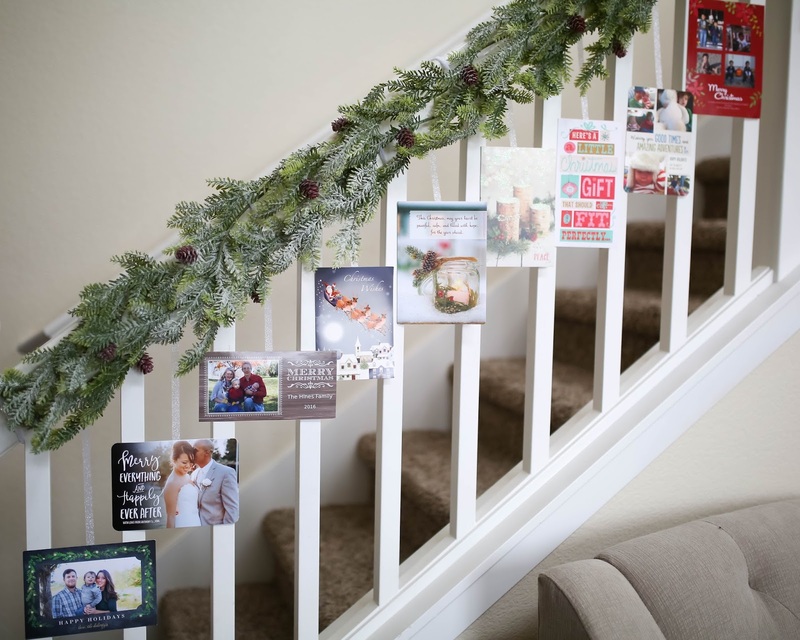 Such a great way to display Christmas cards! I LOVED this pin, now I'm so glad I got to read your blog post! This is SUCH an cute idea! I love this! We live in a one story, but I want to try to emulate this another way next year! I seriously love this so much! Going to do ours right now!!! this is the best idea! I always struggle with what to do with cards, especially photo ones. thanks for this awesome DIY! This is such a cute idea! Now I wish we had stairs!